While Halloween is still a few days away, we know this weekend will be full of events. Harvest festivals, corn mazes, haunted houses, trunk or treat events, parties and more. Thankfully, Salt Lake City, Utah has a LOT of fall activities! We want you to know that there are both good and bad candy options, both of which may end up in your child’s trick-or-treat bags. Of course, here at Salt Lake Dental, our dentists and hygienists aren’t advocates of kids stuffing themselves with tons of sugary snacks. However, we recognize that candy is an important part of the traditions that come along with Halloween. 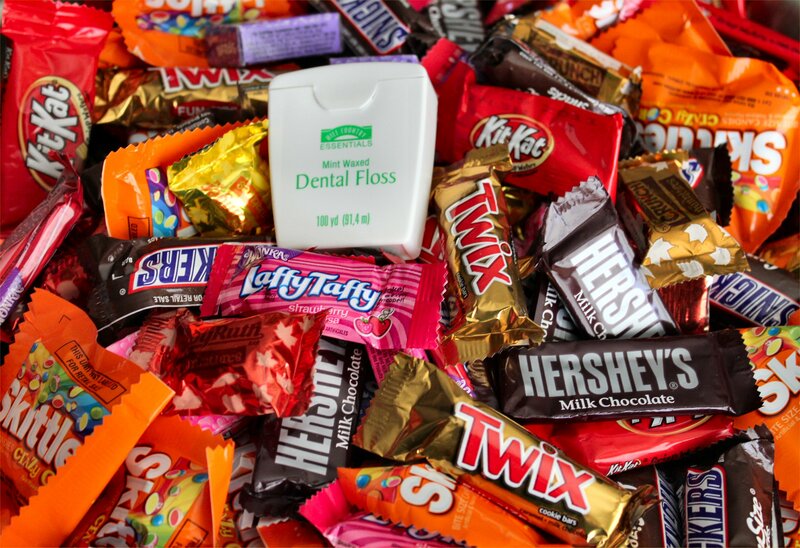 We want to help you figure out which candies are better for their teeth and which ones increase the risk of cavities. Chewy or sticky sweets, such as gummy candies, taffy, caramel. and even dried fruit can be difficult to remove from teeth. These candies are a cause for decay, especially when they get stuck in or between the teeth, where they spend prolonged time. If your child has braces, this can be an even bigger problem. Sour candy is very acidic and can cause damage to tooth enamel. We recommend patients wait 30 minutes to brush their teeth after consuming sour or acidic candies. Sugary snacks, like cookies, cake, brownies, and candy corn all contain high amounts of sugar, which can cause tooth decay. We don’t really think there is a best, but sugar-free lollipops and candies stimulate saliva, which can help prevent dry mouth, which can accelerate decay. Sugar-free gum can actually prevent cavities as it not only dislodges particles from between the teeth but also helps with saliva. Chocolate is a good treat, because it’s quickly eaten and melted away, rather than spending a lot of time in your child’s mouth. We encourage you eat a full dinner before you go out Halloween night. Make the candy a treat, not the main course. Ensure Halloween night ends with a good tooth brushing, along with flossing, and depending on your child’s age, a fluoride mouth rinse. Save a couple of pieces for your child to enjoy, and bring the rest to our Halloween Sweet Swap! We’ve gotten calls and emails, and we are just as excited as you are for our Halloween Sweet Swap on November 1st. We’re ready to get out the Halloween decorations and boo our neighbors in the plaza! The entire community is welcome and invited, this is open to the general public, not just our patients. Please get in touch with us if you’d like a flyer for your work, church or community center. If you want to find a dentist near you, and you’re not in the Salt Lake area, you can search here to find one close by. We look forward to seeing you in a couple of weeks. Be safe and have fun trick or treating!